Boston is a city that was literally reclaimed from the sea. Over 20% of the city’s current land was previously submerged. 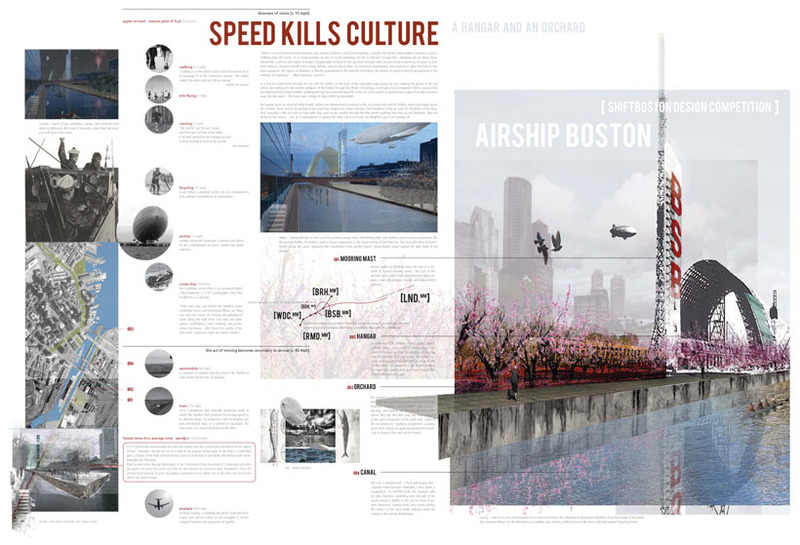 This proposal celebrates and engages Boston’s history of inventing itself by reconfiguring the route of the Boston Marathon to visit lands new and old. 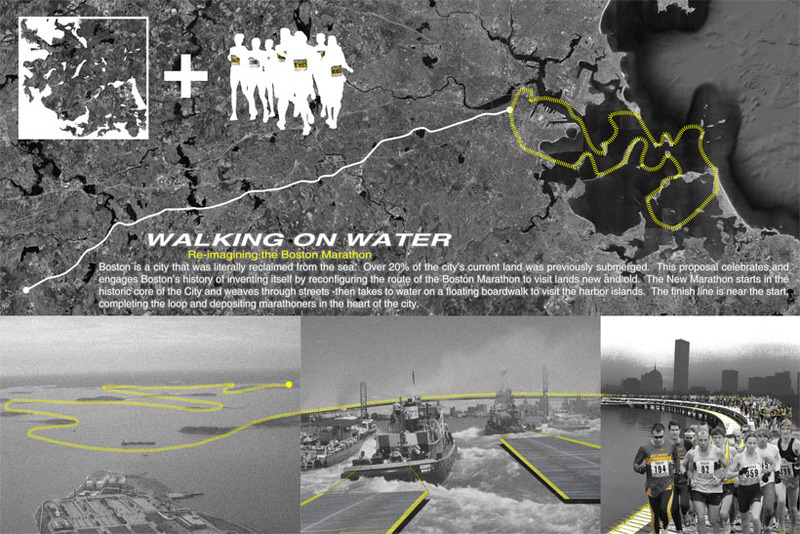 The New Marathon starts in the historic core of the City and weaves through streets – then takes to water on a floating boardwalk to visit the harbor islands. The finish line is near the start completing the loop and depositing marathoners in the heart of the city. With rising sea levels and increased flooding from the Charles and Mystic River, Boston’s destiny seems to be a reversal of that process; the ‘natural condition re-imposed. This project finds a middle ground; rejects the concept of ‘nature’ simply re-asserting herself, but equally rejects the notion of ‘protection’ against nature. 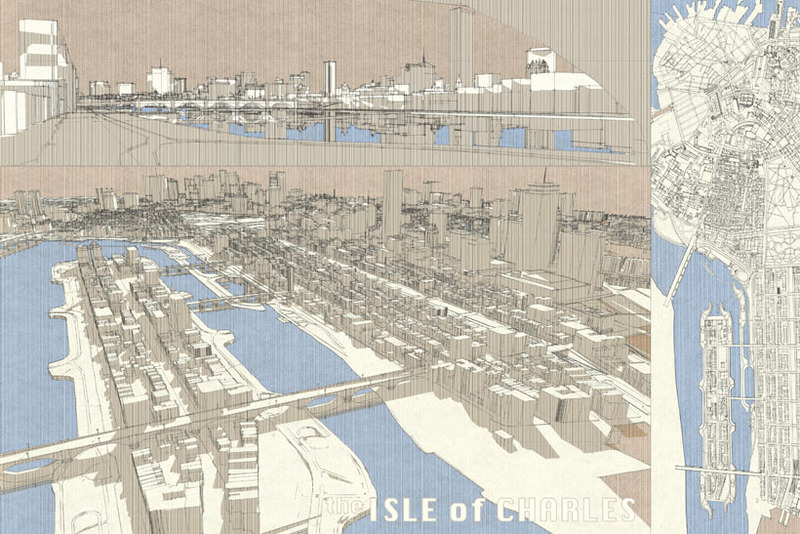 If there is a future for Boston it lies in the re-imagination of the coastal interface. What if the interface is exploded? No longer linear, its dimension becomes infinite. 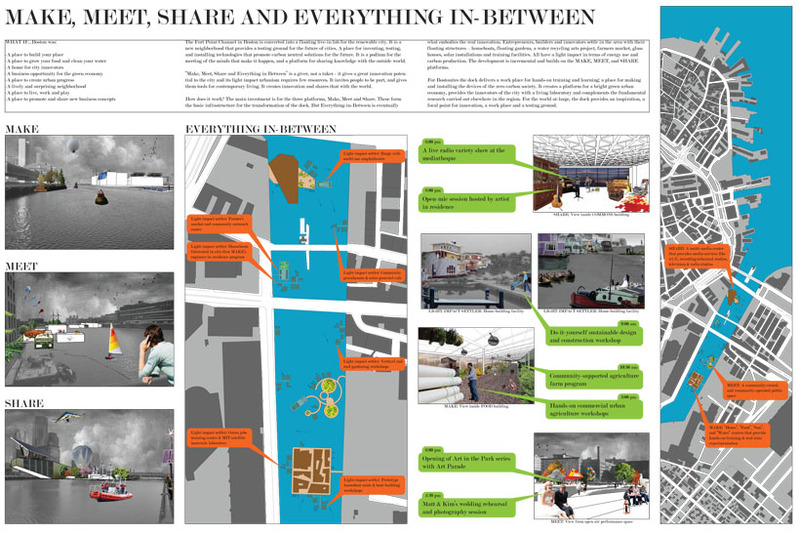 The studied area, south of the Fort Point Channel, and many other Boston districts, offer the opportunity for a new landscape of living: a complex, multi-dimensional interaction with the sea. The spatial complexity of the new interface gives rise to infinite combinations of land and sea, with new, hybrid, land-sea scenarios. Art galleries flood, elevated canals hold water back after the flood, flood water is slowly released, drip-feeding, reminding us and protracting the process of rise and fall. Functions float and move, appear and reappear. The city of Boston has maintained a unique relationship between urban interventions and existing natural conditions. The development of the city, as a city built from reclaimed land, shows a remarkable progression of development out from the city center toward the harbor. Over the last three hundred years, there has been a substantial growth of Boston as the urban center consistently reaches outward. 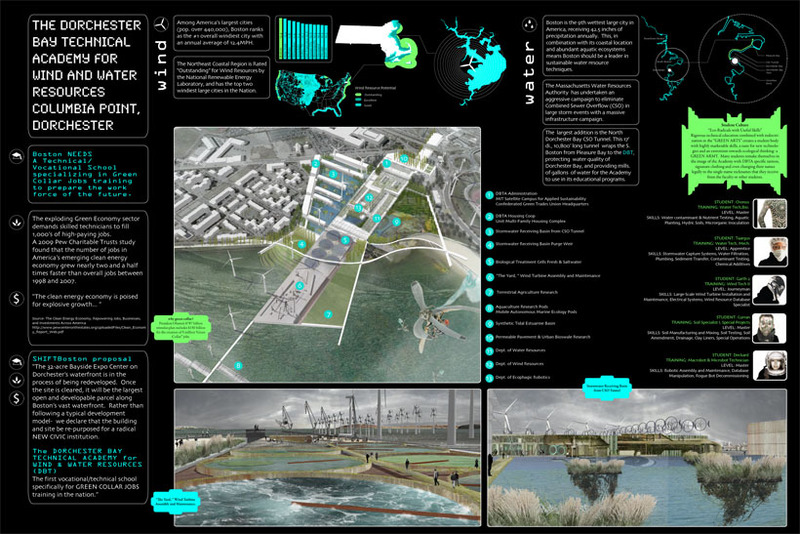 In an attempt to anticipate the extension, the reticulated network foresees the unique development of a large ecological urban intervention on the harbor. 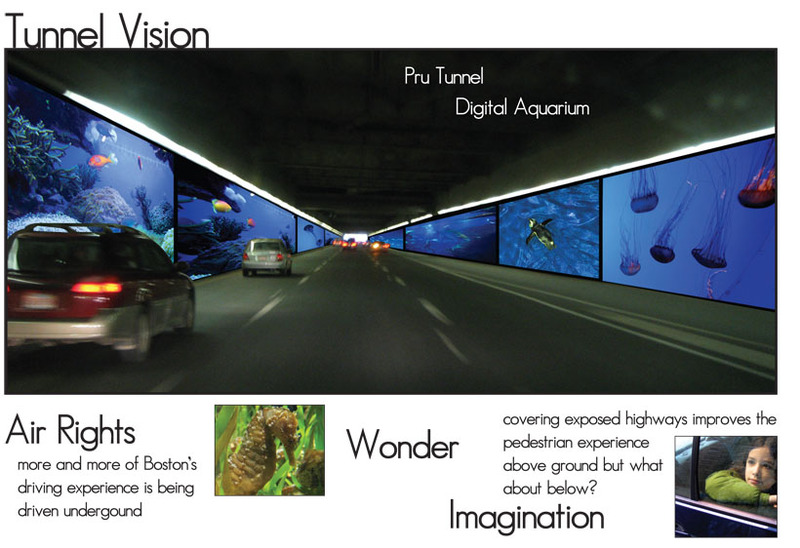 This connective network is versatile in nature, not only anticipating the extension of downtown Boston, but also the connection with other areas adjacent to Boston Harbor. The large-scale infrastructural network facilitates the connection through a matrix of linked elements. Along the edge of the existing harbor, the scale of these connections allows for a dense field of public space and regenerative landscape. As the matrix moves away from the existing city, the field becomes less dense, and allows for larger infrastructural elements to support other programs such as housing and community buildings. To allow for spatial opportunities within the network, program nodes are created through deformations in height. A depression in the system provides a porosity of passage, and the infill of that particular element is water. By raising other elements off of the water, the network sustains an armature for vegetation. The adaptable system accommodates for climate change, rising sea levels, and the growth of the urban center. 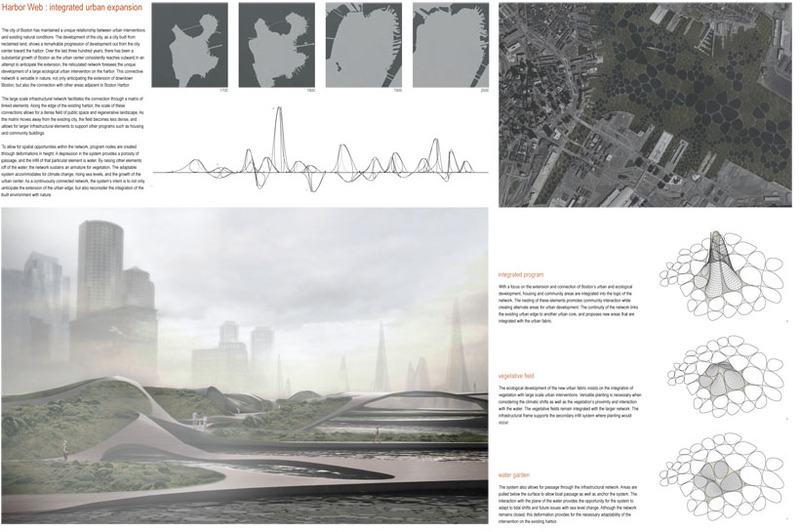 As a continuously connected network, the system’s intent is to not only anticipate the extension of the urban edge, but also reconsider the integration of the built environment with nature. Boston needs a Technical/ Vocational school specializing in green collar jobs training to prepare the work force of the future. The 32-acre Bayside Expo Center on Dorchester’s waterfront is in the process of being redeveloped. Once the site is cleared, it will be the largest open and developable parcel along Boston’s vast waterfront. Rather than following a typical development model- we declare that the building and site be re-purposed for a radical new civic institution. 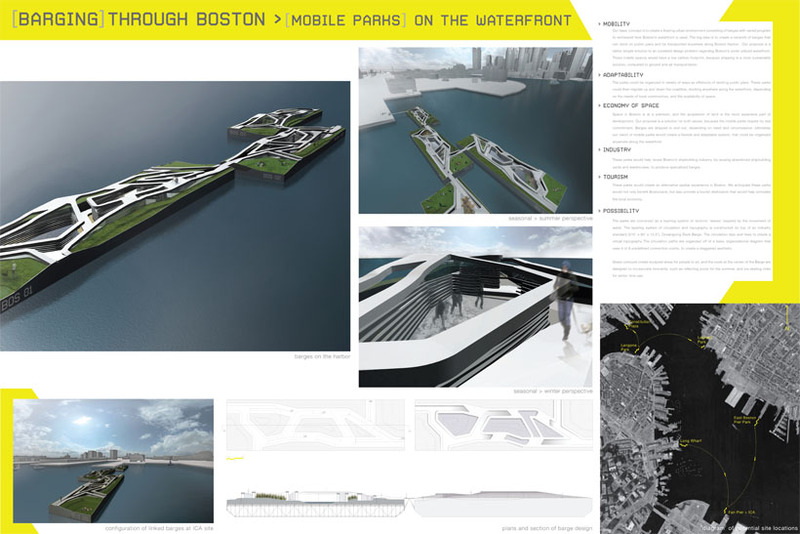 Our basic concept is to create a floating urban environment consisting of barges with varied program to reinterpret how Boston’s waterfront is used. The big idea is to create a network of barges that can dock on public piers and be transported anywhere along Boston Harbor. 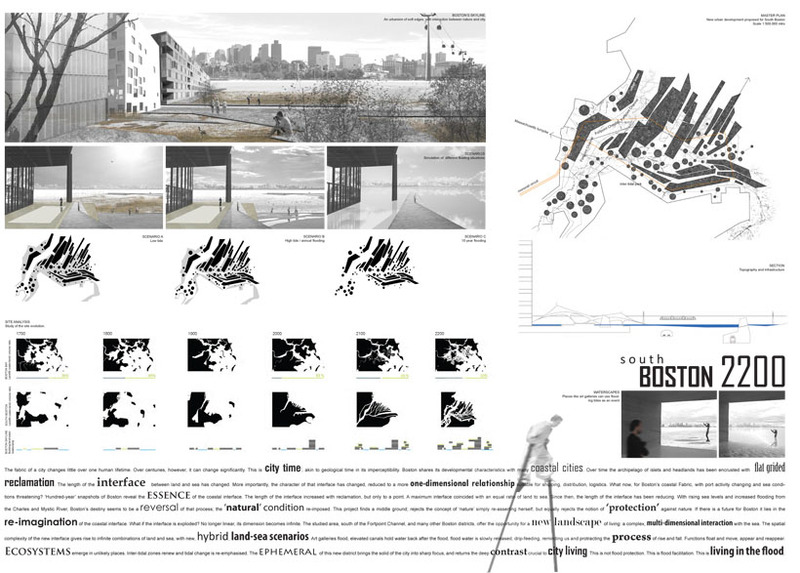 Our proposal is a rather simple solution to an outdated design problem regarding Boston’s under utilized waterfront. These mobile spaces would have a low carbon footprint, because shipping is a more sustainable solution, compared to ground and air transportation. The Fort Point Channel in Boston is converted into a floating live-in lab for the renewable city. It is a new neighborhood that provides a testing ground for the future of cities. A place for inventing, testing, and installing technologies that promote carbon neutral solutions for the future. It is a podium for the meeting of the minds that make it happen, and a platform for sharing knowledge with the outside world. Entrepreneurs, builders and innovators settle in the area with their floating structure- houseboats, floating gardens, a water recycling arts project, farmers market, glass houses, solar installations and training facilities. All have a light impact in terms of energy use and carbon production. The development is incremental and builds on the Make, Meet, and Share platforms. Imagine a network of small food-producing gardens all over greater Boston- a visual register of growing friendships between neighbors, growing interest in sustainable urban agriculture, and diminished reliance on processed, far-getched, mysteriously grown food. 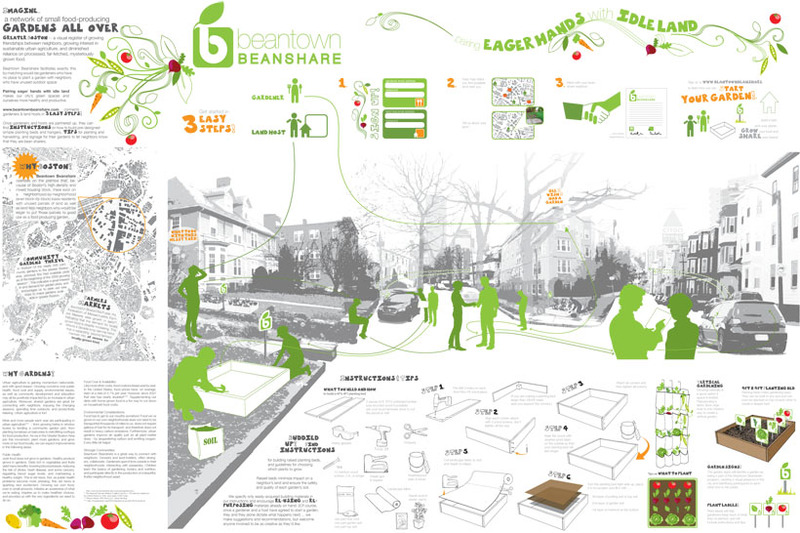 Beantown Beahshare facilitates exactly this by matching would-be gardeners who have no place to plant a garden with neighbors who have unused outdoor space. Pairing eager hands with idle land makes our city’s green spaces and ourselves more healthy and productive. 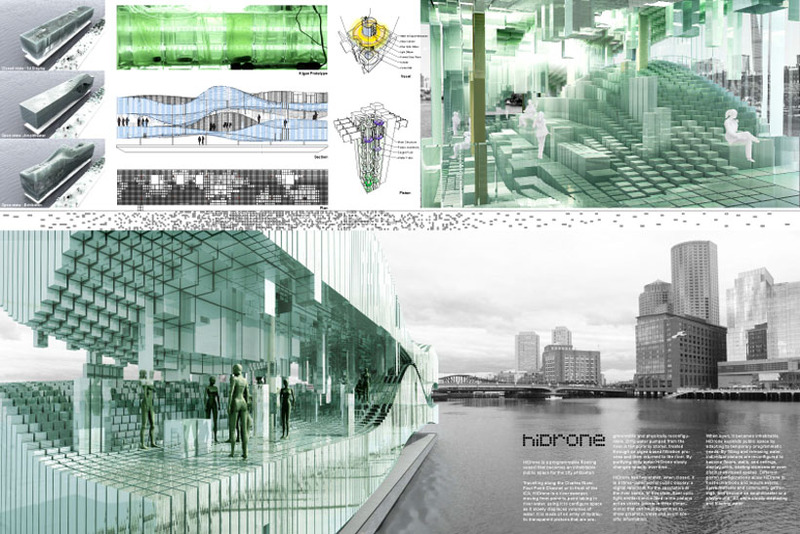 HiDrone is a programmable floating vessel that becomes an inhabitable public space for the city of Boston. Traveling along the Charles River, Fort Point Channel or in front of the ICA, HiDrone is a river sweeper, moving from point to point taking in river water, using it to configure space as it slowly displaces volumes of water. It is made of an array of hydraulic transparent pistons that are programmable and physically reconfigurable. Dirty water pumped from the river is temporarily stored, treated through an algae-based filtration process and then returned to the river. By purifying dirty water HiDrone slowly changes opacity over time. HiDrone has two states; when closed, it is a three-dimensional public display, a digital landmark for the spectators at the river banks. In this state, fiber optic light emitters embedded in the pistons act as voxels (pixels in three dimensions) that can be programmed to show graphics, video and event specific information. When open, it becomes inhabitable. HiDrone expands public space by adapting to temporary programmatic needs. By filling and releasing water, individual pistons are reconfigured to become floors, walls, and ceilings, display units, seating elements or even distinct enclosed spaces. Different piston configurations allow HiDrone to host exhibitions and leisure events, serve festivals and community gatherings, and become an amphitheater or a playground. All while slowly displacing and filtering water. 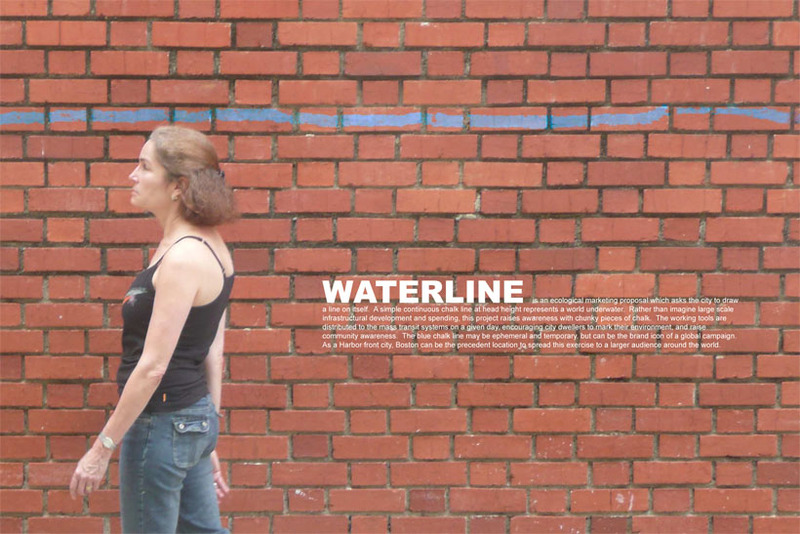 Waterline is an ecological marketing proposal which asks the city to draw a line on itself. A simple continuous chalk line at head height represents a world underwater. Rather than imagine large scale infrastructural development and spending, this project raises awareness with chunky pieces of chalk. The working tools are distributed to the mass transit systems on a given day, encouraging city dwellers to mark their environment, and raise community awareness. The blue chalk line may be ephemeral and temporary, but can be the brand icon of a global campaign. As a Harbor front city, Boston can be the precedent location to spread this exercise to a larger audience around the world. Buoyant structure responds to rising seas. The Green Art Structure acts as just that- a boat- which is permanently docked in the harbor. The structure moves up and down on a pile system, with soil layers resting on a triangular web structure and waterproof ‘hull’. As sea levels rise, the entire hull rises on the buoyant piles. 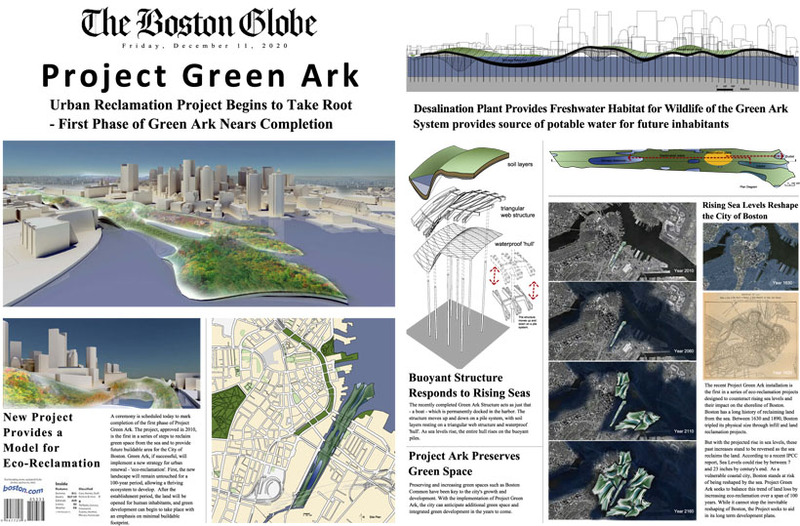 The Project Green Ark installation is the first in a series of eco-reclamation projects designed to counteract rising sea levels and their impact on the shoreline of Boston. Boston has a long history of reclaiming land from the sea. With the projected rise in sea levels, these past increases stand to be reversed as the sea reclaims the land. Fort Point Channel as a historical water field enjoyed its unique space/time qualities in Boston downtown area, and is expected to become a great civic space of the city. However, the Channel as such is suffered by the fact that the two sides are spatially as well as functionally divided. The existing bridges over the Channel provide no more than circulation links, a new kind of connection to make difference is the challenge this proposal intends to respond. The idea is to install a mesh of piles in the back, also the longest, basin of the Channel delimited by the crossing bridges. The piles, deployed with different distances under the water, are designed with three segments extendable to reach different heights. They can therefore up rise to near the water surface, or to above the surface, and can reach even as high as 3 0 meters to catch winds with inbuilt wind- power devices on the top. 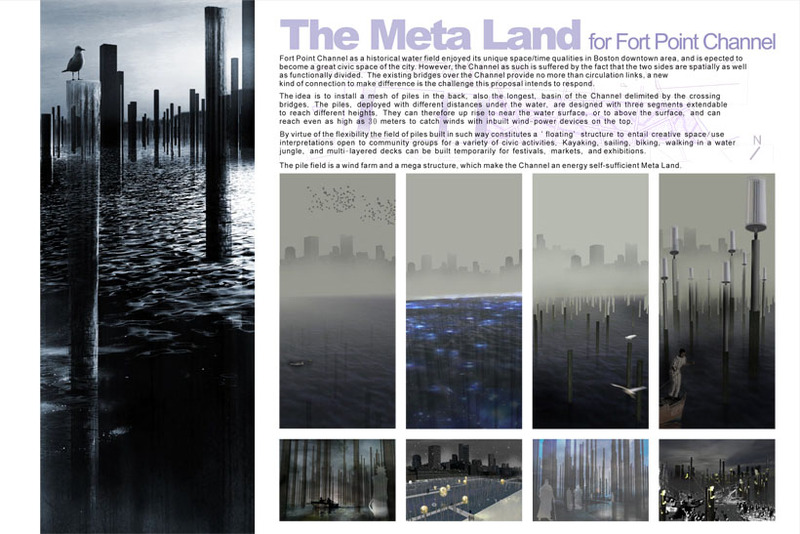 By virtue of the flexibility the field of piles built in such way constitutes a ' floating' structure to entail creative space/ use interpretations open to community groups for a variety of civic activities. Kayaking, sailing, biking, walking in a water jungle, and multi- layered decks can be built temporarily for festivals, markets, and exhibitions. The pile field is a wind farm and a mega structure, which makes the Channel an energy self-sufficient Meta Land.